X. Shari Li is a senior research scientist in the Applied Materials and Performance Group within the Energy and Efficiency Division. She joined PNNL in 1994. 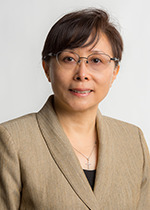 X. Shari Li's research has focused on material synthesis and film deposition. She has extensive experience in the development of various coatings for medical, energy and environmental applications. Recently her work has focused on the development of gas separation membranes; CO2 adsorbents. X. Shari Li is named as inventor in 20 US patents. She has received two R&D 100 Awards, an Inaugural MICRO/NANO 25 Award. She also received Battelle Distinguished inventor award in 2016. U.S. Patent No. 10,254,248, April 9, 2019, "COLLECTION, RELEASE, AND DETECTION OF ANALYTES WITH POLYMER COMPOSITE SAMPLING MATERIALS ". U.S. Patent No. 9,937,484, April 10, 2018, "Reactor, CO2 sorbent system, and process of making H2 with simultaneous CO2 sorption ". U.S. Patent No. 9,370,749, June 21, 2016, "POROUS MULTI-COMPONENT MATERIAL FOR THE CAPTURE AND SEPARATION OF SPECIES OF INTEREST". U.S. Patent No. 9,259,708, February 12, 2016, "Device and Method for Enhanced Collection and Assay of Chemicals with High Surface Area Ceramic". U.S. Patent No. 9,079,136 , July 14, 2015, "Thin, Porous Metal Sheets and Methods for Making the Same". U.S. Patent No. 8,203,023, June 19, 2012, "Tailored Fischer-Tropsch Synthesis Product Distribution". U.S. Patent No. 7,955,574, June 7, 2011, "Porous Thin Film and Process for Analyte Preconcentation and Determination". Kwak J., J.H. Lee, D. Kim, X.S. Li, D.N. Tran, and C.H. Peden. 2011. "Deactivation Mechanisms of Base Metal/Zeolite Urea Selective Catalytic Reduction Materials, and Development of Zeolite-Based Hydrocarbon Adsorber Materials." In 2011 Annual Progress Report: Advanced Combustion Engine Research and Development, edited by G Singh. 231-237. Washington Dc:Department of Energy: Energy Efficiency & Renewable Energy. PNNL-21074. Zhang J., W. Xu, X.S. Li, and W. Liu. 2010. "Air Dehydration Membranes for Nonaqueous Lithium-Air Batteries." Journal of the Electrochemical Society 157, no. 8:A940-A946. PNNL-SA-71658. Tarasevich B.J., A. Gutowska, X.S. Li, and B. Jeong. 2009. "The Effect of Polymer Composition on the Gelation Behavior of PLGA-g-PEG Biodegradable Thermoreversible Gels." Journal of Biomedical Materials Research. Part A 89A, no. 1:248-254. PNNL-SA-59333. Johnson B.R., N.L. Canfield, D.N. Tran, R.A. Dagle, X.S. Li, J.D. Holladay, and Y. Wang. 2007. "Engineered SMR catalysts based on hydrothermally stable, porous, ceramic supports for microchannel reactors." Catalysis Today 120, no. 1:54-62. PNNL-SA-53034. Li X.S., G.E. Fryxell, C.M. Wang, and J.A. Young. 2007. "Templating Mesoporous Hierarchies in Silica Thin Films Using the Thermal Degradation of Cellulose Nitrate." Microporous and Mesoporous Materials 99, no. 3:308-318. PNNL-SA-54344. Yang Z., G. Xia, X.S. Li, and J.W. Stevenson. 2007. "(Mn,Co)(3)O-4 Spinel Coatings on Ferritic Stainless Steels for SOFC Interconnect Applications." International Journal of Hydrogen Energy 32, no. 16:3648-3654. PNNL-SA-50053. Yang Z., G. Xia, X.S. Li, P. Singh, and J.W. Stevenson. 2007. Fabrication of (Mn,Co)3O4 Surface Coatings onto Alloy Substrates. PNNL-16470. Richland, WA: Pacific Northwest National Laboratory. Li X.S., A.R. Courtney, W. Yantasee, S.V. Mattigod, and G.E. Fryxell. 2006. "Templated synthesis of mesoporous titanium phosphates for the sequestration of radionuclides." Inorganic Chemistry Communications 9, no. 3:293-295. PNNL-SA-46567. Li X.S., G.E. Fryxell, C.M. Wang, and J.S. Young. 2006. "Nitrocellulose Templated Hierarchical Pore Structure in Mesoporous Thin Films." Inorganic Chemistry Communications 9, no. 1:7-9. PNNL-SA-46531. Shin Y., C.M. Wang, X.S. Li, and G.J. Exarhos. 2005. "Synthesis of supported carbon nanotubes in mineralized silica-wood composites." Carbon 43, no. 5:1096-1098. PNNL-SA-39765. Williford R.E., G.E. Fryxell, X.S. Li, and S. Addleman. 2005. "Mechanism of Hierarchical Porosity Formation in Silica Thin Films using Cellulose Nitrate." Microporous and Mesoporous Materials 84, no. 1-3:201-210. PNNL-SA-43308. Williford R.E., R.S. Addleman, X.S. Li, T.S. Zemanian, J.C. Birnbaum, and G.E. Fryxell. 2005. "Pore Shape Evolution in Mesoporous Silica Thin Films: from Circular to Elliptical to Rectangular." Journal of Non-crystalline Solids 351, no. 27-29:2217-2223. PNNL-SA-41313. Williford R.E., X.S. Li, R.S. Addleman, G.E. Fryxell, S. Baskaran, J.C. Birnbaum, and C.A. Coyle, et al. 2005. "Mechanical Stability of Templated Mesoporous Silica Thin Films." Microporous and Mesoporous Materials 85, no. 3:260-266. PNNL-SA-44235. Li X.S., G.E. Fryxell, J.C. Birnbaum, and C.M. Wang. 2004. "Effects of Template and Precursor Chemistry on Structure and Properties of Mesoporous TiO2 Thin Films." Langmuir 20, no. 21:9095-9102. PNNL-SA-38936. Li X.S., G.E. Fryxell, J.C. Birnbaum, and C.M. Wang. 2004. "The Effects of Template and Precursor Chemistry on Structure and Properties of Mesoporous TiO2 Thin Films." Langmuir 20, no. 21:9095-9102. PNNL-SA-42064. Shin Y., X.S. Li, C.M. Wang, J.E. Coleman, and G.J. Exarhos. 2004. "Synthesis of Hierarchical Titanium Carbide from Titania-Coated Cellulose Paper." Advanced Materials 16, no. 14:1212-1215. PNNL-SA-41057. Birnbaum J.C., G.E. Fryxell, X.S. Li, C.A. Coyle, G.C. Dunham, and S. Baskaran. 2003. "Effects of Trace Metals and Organic Additives on Porosity and Dielectric Constant of High Purity Mesoporous Silica Films." Chemical Communications 2003, no. 15:1830-1831. PNWD-SA-5825. Chin Y., Y. Wang, R.A. Dagle, and X.S. Li. 2003. "Methanol steam reforming over Pd/ZnO: catalyst preparation and pretreatment studies." Fuel Processing Technology 83, no. 1-3:193-201. PNNL-SA-36816. Li X.S., J.C. Birnbaum, R.E. Williford, G.E. Fryxell, C.A. Coyle, G.C. Dunham, and S. Baskaran. 2003. "Effect of Humidity Treatments on Porosity and Mechanical Integrity of Mesoporous Silica Films." Chemical Communications. PNWD-SA-5824. Birnbaum J.C., X.S. Li, C.R. Yonker, G.E. Fryxell, and S. Baskaran. 2002. "Effect of Solution Chemistry and Speciation on Shelf-life of Silica Sols and Characteristics of Deposited Mesoporous Thin Films." Chemical Communications 19. PNNL-SA-36867. Campbell A.A., B.L. Deatherage, X.S. Li, B.J. Nelson, C.R. Bottoni, and E. Dejong. 2002. "Hydroxyapatite Coatings Produced by Surface-Induced Mineralizaiton." In Biominetic Calcium Phosphate Coatings. 47-54. Trivandrum:Research Signpost. PNNL-SA-35282. Campbell A.A., L. Song, X.S. Li, B.J. Nelson, C.R. Bottoni, D.E. Brooks, and E. Dejong. 2000. "Development, Characterization, and Anti-Microbial Efficacy of Hydroxyapatite-Chlorhexidine Coatings Produced by Surface-Induced Mineralization." Journal of Biomedical Materials Research 53, no. 4:400-407. PNNL-SA-32169. Wang Y., A.Y. Kim, X.S. Li, L.Q. Wang, C.H. Peden, and B.C. Bunker. 2000. "Shape Selective Solid Acid Catalysts Based on Tungstophosphoric Acid Supported on Mesoporous Silica." In Shape-Selective Catalysis, edited by Chunshan Song, Juan M. Garces and Yoshihiro Sugi, 738, 353-368. Washington, District Of Columbia:American Chemical Society. PNNL-SA-31580. Elder S.H., Y. Gao, X.S. Li, J. Liu, D.E. McCready, and C.F. Windisch. 1998. "Zirconia-Stabilized 25-AngstromTiO2 Anatase Crystallites in a Mesoporous Structure." Chemistry of Materials 10, no. 10:3140-3145. PNNL-SA-31040.